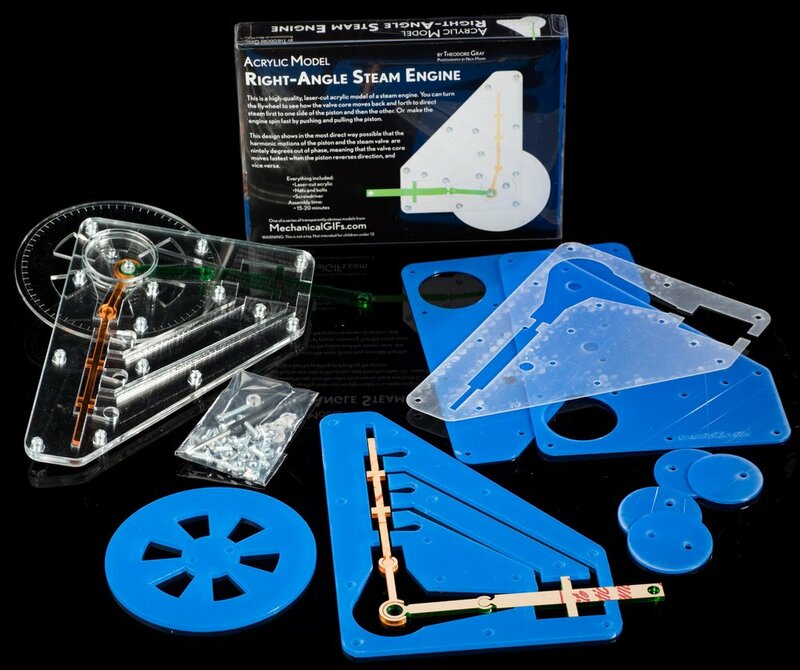 This model steam engine is designed to make as explicit as possible the fact that the piston and valve in a steam engine operate 90 degrees out of phase with each other. You can see in the video that both the piston (green horizontal part) and the valve (orange vertical part) are speeding up and slowing down. Furthermore, their motion is "harmonic", which means that the parts trace out a sine wave as a function of time. A sine wave is the smoothest possible form of back-and-forth motion. The part moves fastest in the center of its range of motion, and slows down in a smooth and continuous way as it approaches either end of its movement. The piston, for example, goes back and forth, traveling fastest when it's at the center of the cylinder and slowing down as it approaches either end (where it comes to a stop and changes direction). The connecting rod between the piston and the flywheel translates this back-and-forth motion into circular motion of the flywheel (which is large and heavy to ensure that it spins at a nearly constant rate). The piston is driven by the pressure of steam routed to it through a valve. This engine is "double acting", which means the steam pressure pushes the piston in both directions alternately. The valve is called a "spool valve" because it looks a bit like a spool of thread. In order for the engine to run, the valve and the piston have to follow a perfectly timed dance of alternating fast and slow movement. When the piston is in the center of its stroke, moving fastest, the valve needs to stay in position to keep feeding steam to the side it's currently pushing on. But when the piston comes to rest at the end of its stroke, the valve needs to—as quickly as possible—switch over to direct steam to the other side of the piston to push it back in the other direction. In other words, when the piston is moving fastest, the valve should be stationary, and when the piston is moving slowest, the valve should be moving fastest. Both parts follow a sine wave through time, but their waves are shifted relative to each other by 1/4 cycle. Another word for 1/4 cycle, one fourth of the way around a circle, is 90 degrees. Hence we say that the motions are "90 degrees out of phase". You can break down the motion of this engine into four phases, each representing one quarter turn of the flywheel (which is rotating steadily in a counter-clockwise direction). 1) Piston is moving rapidly to the right, pushed by steam pressure entering from the inlet and being routed through the lower channel to the left side of the piston. Old steam is exiting through the upper channel from the right side of the piston. The valve is momentarily not moving. 2) Piston has come to rest on the right end of the cylinder, and steam flow is briefly stopped while the valve core is moving rapidly upwards. 3) Piston is moving rapidly to the left, pushed by steam entering from the inlet and traveling through the upper channel. Old steam is exiting through the lower channel. The valve has come to a stop at this point. 4) Steam flow is again briefly interrupted as the piston comes to a stop at the left end of the cylinder. The valve is moving as fast as it can downwards to open up the lower steam channel for a return to step 1. This annotated animation shows how each side of the piston switches between high-pressure steam (red) and exhaust (blue) phases. I think this gif is about the best that can be done in virtual animation form to show how these things work. But does it still seem confusing? It is! At least it was to me. I found the whole thing really quite difficult to grasp in an intuitive way, despite having watched many videos and animations illustrating this mechanism. It honestly was not until I had a visible model steam engine to play with that it finally started to make sense. I needed to be able to rotate the thing at my own speed, and take it through its cycle over and over again until the timing made sense. You may think it's self-serving for me to say this, but it was creating this model that got me to understand the machine, and I think you too will understand it much better from a physical model than from any animation or attempted explanation. Which is why it's so lucky that you can get one from me!